30% of native solitary bees make their nests in old beetle tunnels in dead trees. These same bees will be attracted to artificial bee houses that provide a similar habitat. Solitary bees and wasps do not have a queen, each and every individual female lays her own eggs. Species that lay their eggs in wood tunnels look for a hole of suitable size and length to lay eggs. 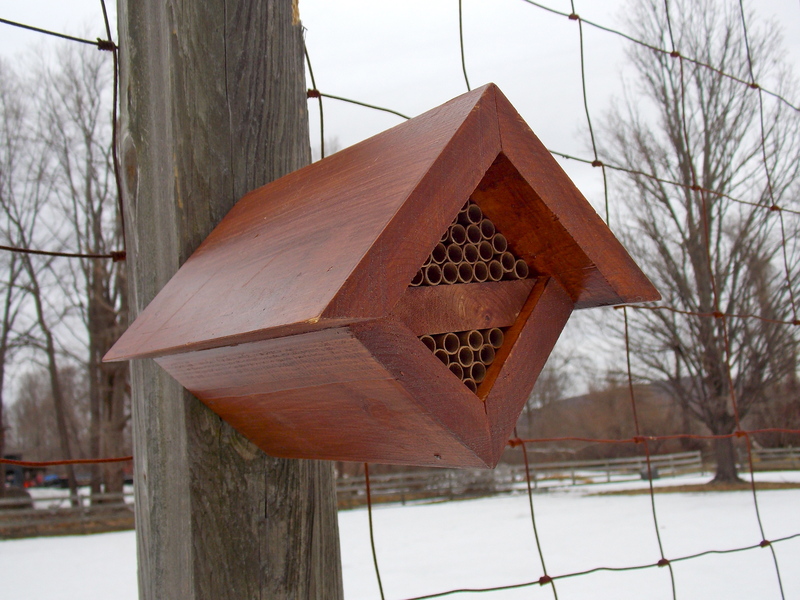 The perfect hole size for mason bees, to include the blue orchard bee and its non-native counterpart the hornfaced bee, is a hole diameter of 5/16″ in diameter and six inches in deep. Female eggs are laid first, than male eggs. If the hole is to shallow, fewer female off spring will be produced. In addition to bees, some native solitary wasps will also take advantage of this habitat. Bees that will be attracted to your bee house include: mason bee (blue orchard bee), wool carder bee, leaf cutter bee and potter wasps. None of your new residents will sting you. All are docile non-aggressive bees. There are a number of ways to create habitat for cavity nesting bees. In all cases make sure that the nests are in a dry sunny location protected from the worst weather. Sunny southern exposures make better nest sites as the larvae will spend the winter in these tubes and emerge in the spring. 1) Drill holes in existing tree snags, stumps, logs, fenceposts or other wooden areas in your backyard. Holes should range between 3/32″ and 3/8″ and be closed at one end. The smaller holes do not need to be as deep as smaller bees require less space. 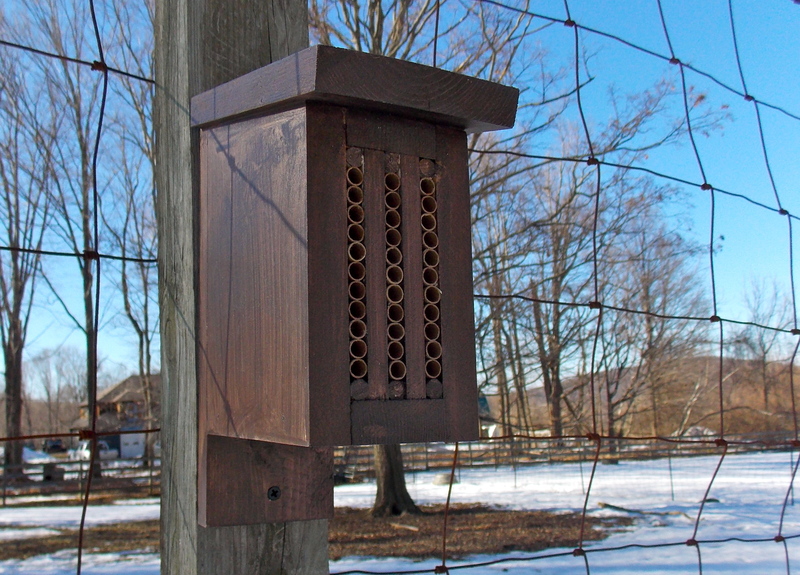 2) Purchase an already constructed nest box with replaceable tubes. Paper tubes are easily replaced so bees do not reuse the same holes that could spread disease. 3) Cut raspberry or blackberry stems in the winter as these will make ideal homes for small carpenter bees and some types of sweat bees in the spring. 4) Create stem and tube bundles about 6 to 8″ in length of plants that are naturally hollow such as teasel, bamboo, reeds, sumac and even brambles such as blackberry or raspberry (perfect for the small carpenter bee). The stems should be cut as close to stem nodes as possible to ensure a closed end. Bumble bees are social bees and have a hive with a queen, workers and drones. Bumble bees queens are not too picky as to where they choose to live and typically live in an old mouse nest or under a grass tussock. A simple box can make a perfect shelter for bumblebees. These boxes can be placed on the ground in a shady area. 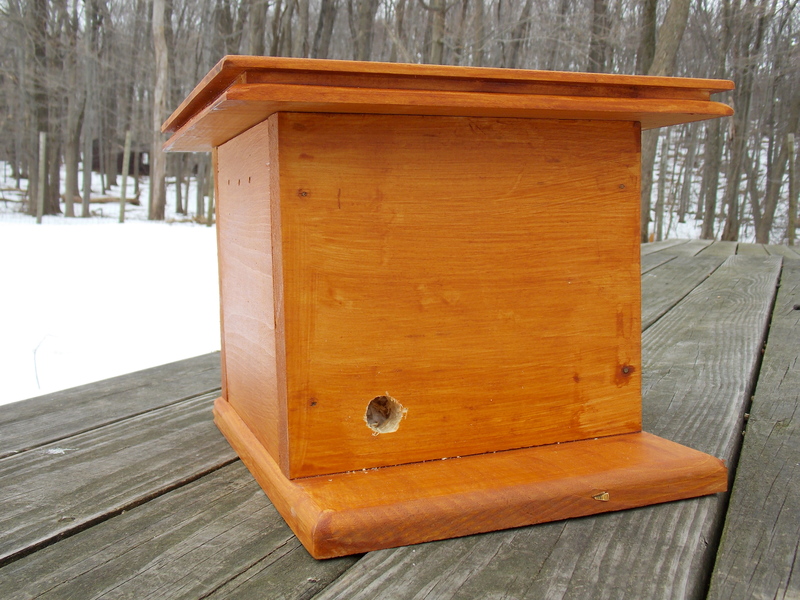 Artificial nest boxes have a low occupancy rate of less than 30%. So having a few boxes will increase the odds that queen bee will select a box as her nest site. They should be put in place very late in the winter or very early in the spring to increase the odds that a emerging queen will find a nest site ready at the time of her search.